Beautiful frame! Made very well and delivery was quick! This is a beautiful frame and looks amazing with my Cinderella canvas. Though I was a little nervous about ordering a special size, the frame was a perfect fit! It is a quality frame and I would not hesitate to recommend this frame to a friend. Excellent quality and the frame looks like a million bucks! I got a 24*36 frame to put it in our living room with my newborns picture and it melts my heart everytime I see it! I purchased this particular frame for two classic pictures. My husband and I purchased two Van Gogh's from the Metropolitan Museum of Art in NYC and only an ornate frame could house a Van Gogh! 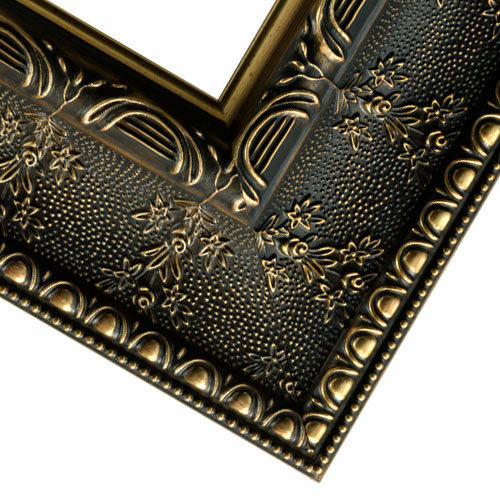 Love the flower design imbedded in the frame with the gold accents. Can't wait to receive my order!